Northern Stranglethorn was on Eveania's travel card, until things became a bit crowded and she lost interest. At one point, she had to finally call everybody together and insist that there would be no more wandering off from the group. Squirtz is tempermental to begin with and prefers all the attention. Although still in a minor way, he does contribute to a fight which he feels justifies his position. 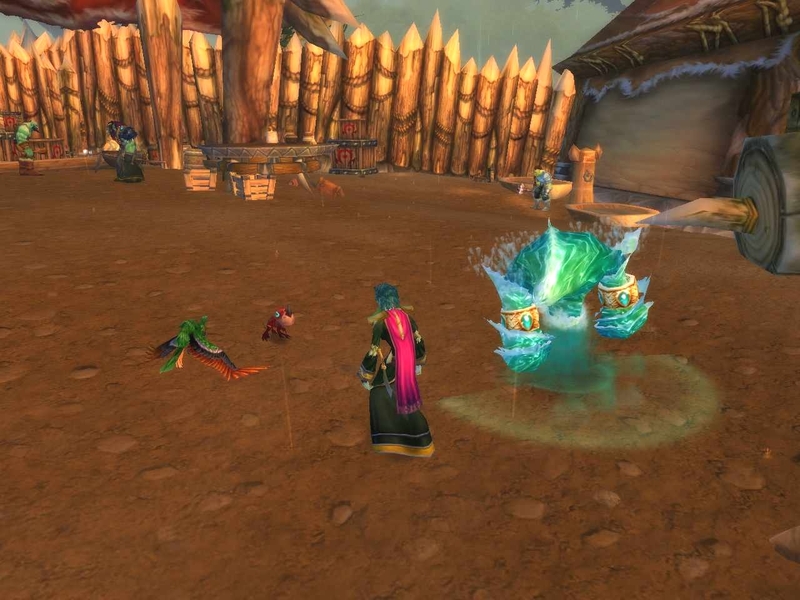 The lashtail hatchling is the worse one for wandering off, sometimes bringing un-wanted company back with him.﻿ Bird is just....Bird. He just follows and watches over everything with the most unassuming gaze. Don't matter where we go. Land, water, taxi flight or zepps. He's just ... there. With one exception. Looting. He has to check it all out before allowing Eveania to gather it up, and gets quite vocal about doing so. He does have enough sense to hang back during a fight though, a nice safe distance behind. Things are going along fairly well with this adventure into the Horde nation. Seeing things from the opposite factions point of view is interesting and thought prevoking. Esie is an Undead spriest, Eveania (undocumented sister), took up frost mage magic. More recently and I guess for the sake of some form of balance, Crazzel has joined this group, sorta-kinda. He happens to be a very young Troll hunter. I think this was more about getting to know the Troll leader. His views of Hellscream as the Horde leader, well, he's just not very favorable of Thrall's choice. More conflict ahead, surely. Hmmmmm? By my count, that is now two factions who do not like or trust Hellscream. Then there's that little thing in Org where Hellscream pushed the Trolls off to the far side, next to the goblin slums. Does anyone else remember the old battle strat of 'Divide and Conquer', besides me? IDK. From an Alliance pov, the Trolls could possibly be enlisted. Looking in from the Horde side, Stormwind leadership has certainly made a lot of unhappy human citizens homeless. Both factions are seeing blood and war as necessary. Both have dissent within their ranks. Enter, The Pandas. Strained and fragile Balance? *As regular readers will quickly see, this post is way outside of whatever possibility of a somewhat "norm" may be for MJ. It's okay though. Probably just one of those stray fragments floating by. Mawhahhahah!